Sony has today released firmware 3.0 for NW-WM1 Signature series Walkman® players and firmware 2.0 for NW-ZX300 series Walkman® players. 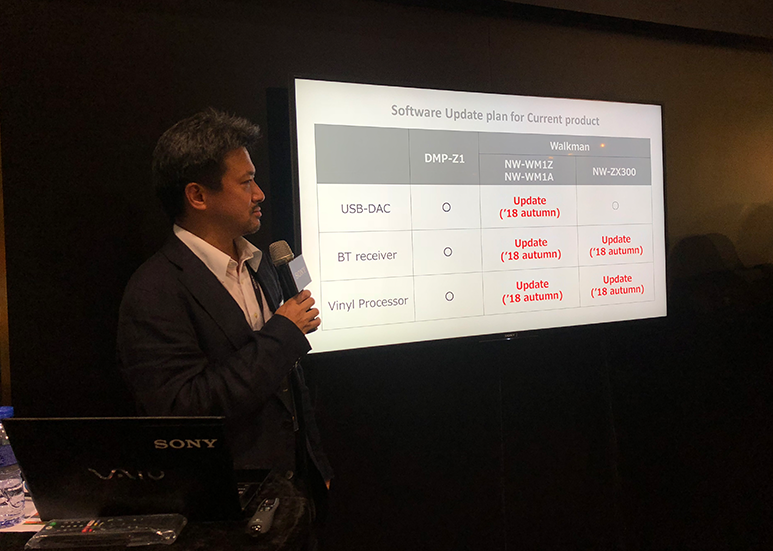 On the 11th of August 2018, we published the news of an Autumn Update for WM-1Z, WM-1A, and ZX300 as shared by Sony Walkman® Project Leader / Senior Electrical Engineer Tomoaki Sato during the public session on the new DMP-Z1 at the Hong Kong High-End Audio Visual Show 2018. The firmware 3.0 for NW-WM1 series bring alignments of Sony’s NW-WM1A and NW-WM1Z with that of the carryable DMP-Z1 providing USB-DAC, BT receiver, and Vinyl Processor functionalities while firmware 2.0 for NW-ZX300 series will add BT receiver, and Vinyl Processor functionalities as it already features USB-DAC capabilities. The firmware 3.0 for NW-WM1 series is available for download via Sony’s website. The firmware 2.0 for NW-ZX300 series is available for download via Sony’s support website.